Most women are scrolling through the candidates on Match.com in hopes of scoring a man; but you're not about that life. Instead, you're hanging out in a dreary graveyard, positioned on top of a tombstone, basking in the moonlight, hoping that your one true love will soon find you. You know the man of your dreams isn't browsing through dating sites trying to find you. Your type of guy is brushing up on his French, grooming his mustache, learning the tango, and thinking up eerie, yet endearing ways, to proclaim his undying love for you. 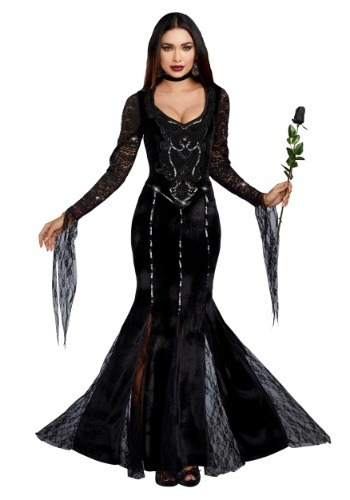 Before you start laying out your quartz crystals in preparation to cast another love spell, you may want to check out this beautiful costume. Outwardly expressing your inner feelings is a great way to find the Goth man of your dreams (or should we say, nightmares?). This floor length gown will make you look like a certified mortuary mama, draping you in charcoal-colored velvet, black lace, and ebony sequins. The ornate tattered sleeves will look amazing whenever you reach for your spell book and the low neckline will surely show off you collection of bejeweled chokers. Ring your eyes with black eyeliner and you've successfully unveiled your new Goth look and exposed your dark soul! Now, it's only a matter of time before your mysterious future bae finds you. Trust us. Pretty soon he'll be calling you his "cara mia" and telling you how you're dearer to him than all the bats in all the caves of the world...or something like that. The funeral themed wedding you've always hoped for is just around the corner. We'll be waiting for our invitation in the mail!